Winter is lingering here in New England, but I am missing cherry blossom trees and warm winds. As the months go by and vintage boutiques are putting out their 60's floral dresses, basket bags, colorful jewelry and pastel colored scarves and I can't help but fall in love. Here are the top 5 spring essentials every retro babe needs! Think 70's, summer-y, funky and fun. 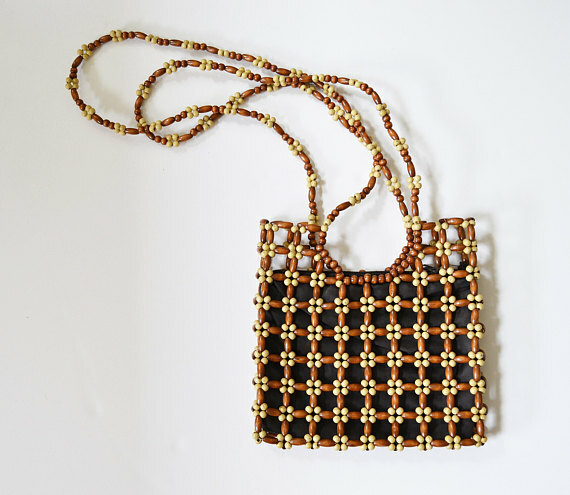 This etsy vintage find is a perfect bag for any vintage enthusiast during the summer. Funky, functional and swoon-worthy. I know, I know - "Florals in Spring? Groundbreaking'. This cute floral vintage dress has the ruffle sleeves that are perfect for those breezy Spring days but also bright and sweet for those almost-summer days. This Etsy Vintage is so 60's and sweet. When I see these gorgeous earrings, I think of a glamorous night. But these show stopping vintage earrings are perfect for a brunch, work or any time you want to add some elegance to your spring outfit. These mint flower and rhinestone earrings are a perfect accessory for any retro babe. Vintage loveliness! Envision yourself in a floral 50's style dress - the full skirt laid out as cherry blossoms float through the air. As you enjoy the warmer weather, think about delving into a book full of stories of Golden Hollywood. Perfection.